Few movies can boast as much star power as Robert Schwentke’s RED. With big-name actors such as Bruce Willis, Morgan Freeman, Helen Mirren, John Malkovich, and cameo of old-timer Ernest Borgnine, one might think Red is a recipe for success, yet it proves a good film is not made with sheer star power alone. The film begins with RED, Retired and Extremely Dangerous, CIA agent Frank Moses (Willis) being attacked by a government hit squad. After escaping the young and well- trained team of professional CIA killers, the rather elderly Moses reunites with his former gang who also cashed their social security checks a decade ago, and try to find out who is attempting to have them eliminated. 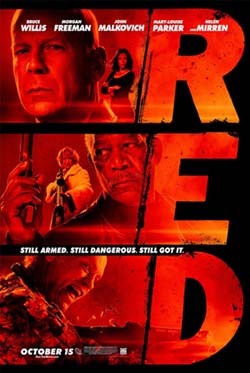 After seeing a trailer for RED, the viewer might think that the movie is a rollercoaster ride of action and adrenalin, yet, like the previews for a bland summer comedy, all the dynamic explosions and fight scenes were previewed in the trailer, leaving few memorable action scenes for the movie. The plot, riddled with more clichés than bullets, is good but is weakened by the mediocre chemistry between the actors. Lines that endeavor to be funny appear forced and predictable. The comedic lines in the script have been used by dozens of other and probably funnier action movies. To conclude, RED is an underwhelming action movie. There are snippets of the movie that show promise yet are put out like a match in a drizzly rain storm. The movie just doesn’t have enough pizzazz to keep it interesting. Site contents copyright © 2019 Recorder Online	except as noted. All rights reserved. | 89 queries in 2.388 seconds.